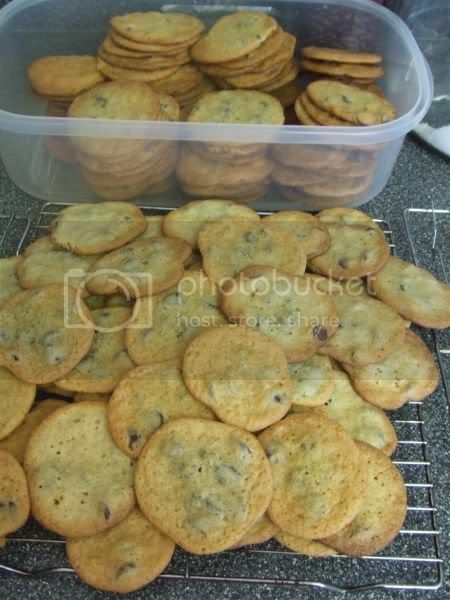 Church needs a lot of cookies for a function next week so I am making up different batches all week. add two eggs, 1 tsp very good quality vanilla and mix together very well. Add the dry to the wet in batches until completely mixed together well. and also you can add 1 cup of finely chopped walnuts or pecans. drop by teaspoon onto ungreased baking sheets. bake at 350 8-10 minutes cool on racks. Serve with a tall glass of frosty cold milk. Store leftovers away from children and husbands they freeze well. OK I gotta start going to your church. yes *munch* they are very *crunch* good. *lipsmack*. Glad you liked them Jim.